UWC-USA offers the International Baccalaureate Diploma Program (IB), one of the most recognized and respected high school diplomas in the world. Our International Baccalaureate curriculum meets the educational requirements for students from many different cultures and countries while also providing a rigorous academic program that offers students a college preparatory education for the world’s best institutions of higher learning. There are more than 600 universities and colleges in nearly 50 countries that accept students with International Baccalaureate credentials. While the UWC-USA IB program is a challenging course of study, students who work hard, have solid study habits, and a keen desire to learn can excel with the help of our experienced faculty and mentors. Because students come from so many different schools and schools systems, our academic leadership staff have developed a keen ability to help students find the courses that challenge them without overwhelming them. Learn more about the courses offered at UWC-USA by downloading our course guide. "[At UWC] I was invited to ask my own questions and to imagine my own answers for the first time." UWC-USA math teacher Ellen Thompson has co-written a book that focuses on the new International Baccalaureate math syllabus, which will be taught starting in the fall of 2019. Do I have to take English at UWC-USA?The IB Diploma requires that all students take a Language A course and a Language B course, but English does not have to be one of them. However, it is strongly recommended that students take English as it broadens their university options and enriches their experience at UWC-USA where all subjects except for languages are taught in English. Academics at UWC-USA features the challenging International Baccalaureate program, small classes, and dedicated faculty. 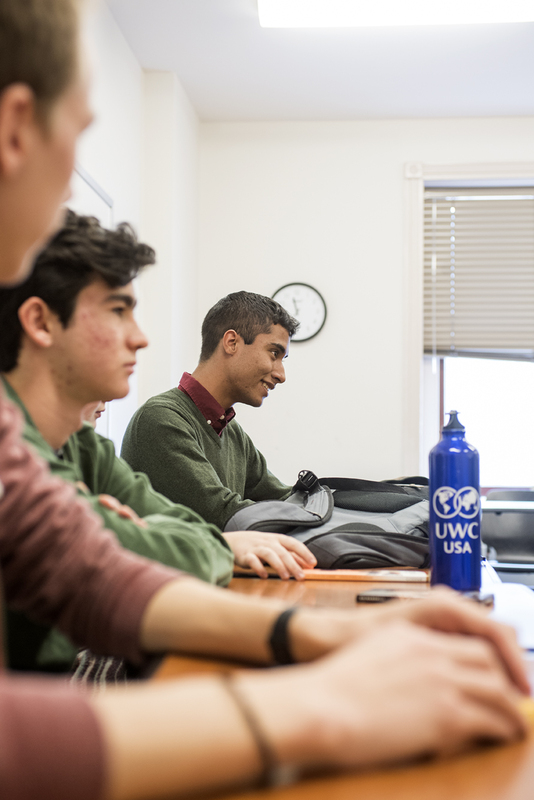 The UWC mission informs not only the academic content faculty choose to explore with students, but also the way it is presented and discussed in class. If education is to be a force that unites people, we expect that to happen in our classes. Faculty also rely on the wide variety of student backgrounds in class to provide context, differing perspectives, and insights driven by diverse cultures. With students coming from more than 90 different countries, they also bring with them different ways of learning. Students from China, Finland, and Africa come from educational models that emphasize lecture or collaborative learning or memorization. While these differences can be challenging, they also present opportunities for students to learn from each other and to increase academic rigor and critical discussion. UWC-USA graduates are prepared for advanced study at the university level after their two-year IB experience in a boarding school. Our partners at universities and colleges routinely speak to our students’ intellectual curiosity, solid academic fundamentals, and capacity for living in a diverse environment. Our students have many opportunities to schedule their own time and learn to manage fun, work, and sleep in appropriate portions. Finally, colleges and universities welcome our students because they are eager to make their communities stronger and more accepting of differences. The extended essay is a required component of the International Baccalaureate curriculum. Students investigate a topic of special interest and develop the independent research and writing skills required at university level. The essay is typically written in one of the student’s six subject groups and must be approximately 4,000 words in length. Students are supported in the research and writing process by an academic supervisor. UWC-USA offers a variety of support for students who are adjusting to the academic rigor of life in Montezuma. The Academic Support Center, housed in the Lockwood Library, supports a variety of tutoring and peer tutoring options. Math faculty staff a math tutoring center during regularly scheduled evening hours. Students learning a new language have the opportunity to receive individual instruction from other students who are native speakers. Each student is assigned a faculty member to be an academic advisor. Students meet routinely with their advisors to review coursework, discuss strategies for academic success, and help plan course selection. Our staff recognize that not all students excel in every subject and some additional support can make the difference. The Lockwood Library at UWC-USA provides the school community with over 12,000 books, dozens of magazines and newspapers, hundreds of movies, and access to online libraries and research databases such as Questia, ProQuest, and JSTOR. Click here to search for materials in the Lockwood Library using Follett’s Destiny Library Management System. Faculty and students may log in to Destiny and navigate to the Home tab to find a list of online research resources. The library is also home to a number of our academic support programs.